Welcome to the July 2015 patch overview that reviews all security and non-security patches that Microsoft released this month for Microsoft Windows and other company products. This is the last Patch Tuesday before the release of Microsoft's new operating system Windows 10. The guide starts with an executive summary that provides you with a quick overview of the most important information. It is then followed by information detailing which Microsoft products and versions are affected by security patches, and then the list of security patches and security advisories. Afterwards, we list non-security patches that may be of interest and how to download and deploy the updates. Microsoft released a total of 14 different security bulletins in July 2015. Four of the bulletins have received the highest aggregate severity rating of critical. All client and server operating systems with the exception of Server Core are affected by at least one critical bulletin. Software affected by vulnerabilities this month include Microsoft Office, Microsoft SharePoint Server and SQL Server. Windows Vista is affected by two critical bulletins while all other client operating systems are only affected by one. The bulletin that affects Vista but no other client operating system is MS15-066 which patches vulnerabilities in the VBScript Scripting Engine. The server side shows a similar picture, only that Server 2003 and 2008 are affected by the same vulnerability while newer Server versions are not. 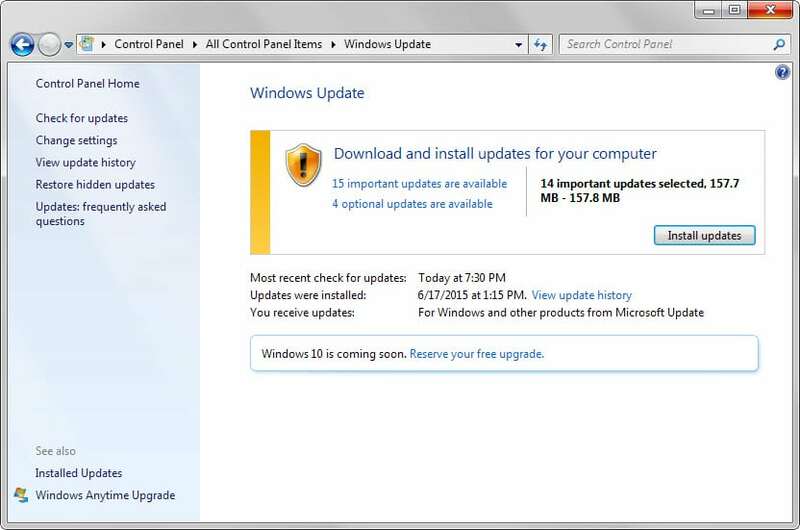 Updates are provided via Windows Update if automatic updates are enabled. Updates are not picked up in real-time by Windows which is why you may want to run a manual check for updates to download and deploy them as soon as possible. Type Windows Update and select the right result. When the new window opens, click on "check for updates" to run a manual check. Windows users who don't want to download updates automatically find them listed on Microsoft's Download Center as well. There they are offered as individual downloads and as a monthly security ISO image. Last but not least, several third-party programs exist that you can use to download all patches in one operation without using Windows Update. The article provides an overview of all security and non-security bulletins and patches that Microsoft released in July 2015. For Windows Server 2003 these are the last updates as starting today, Microsoft no longer supports Windows Server 2003. I see a kb3067903 also. I can’t find any info on it. I get an error when trying to view that link so I can’t see any info it has on it. Would you mind describing it? I could have sworn I saw a content page when I opened it, but I do get a no page exist error as well now. Strange. This security update resolves vulnerabilities in Microsoft Windows. The vulnerabilities could allow remote code execution if an attacker first places a specially crafted dynamic link library (DLL) file in the target user’s current working directory. Then, the attacker convinces the user to open an .rtf file or to start a program that is designed to load a trusted DLL file. But instead, the program loads the attacker’s specially crafted DLL file. An attacker who successfully exploited the vulnerabilities could take complete control of an affected system. An attacker could then install programs; view, change, or delete data; or create new accounts that have full user rights. does not give me confidence in any of _microsofts_products. I got 3 optional updates that want to put the Win 10 reminder thing back in my systray, despite having hid those 3 in the past. I figured they’d auto-unhide them again. sigh. Also, after doing the critical security updates, my (legit) Win 7 de-activated itself, and I was given a popup telling me I needed to activate windows. I’ve had this copy of Windows since beta in 2009. It was just a simple matter of running the activation bit, but still… weird. KB2952664 – Compatibility update for upgrading Windows 7 left aside here as I have for all updates concerning the enthronement of HRH Windows 10. All concerning and concerning only coming update of Windows 10, which I wish not, not at all, not at this time anyway. I did the update and now windows will not load. Anyone else have this problem? I have three servers that no longer boot. The windows Logon Process System process terminated unexpectedly with a status of 0x00000080 (0x00000000 0x00000000). Haven’t been able to recover them yet. I´ve got the same here…more than 30 computers can´t load windows after install the updates, it stops on that “Applying updates..” screen. Anyone with the same issue? Any idea how to fix it? Hey Jim or anyone else. I had the same problem on a clients Windows 2003 server. Seems KB3067505 is the problem. This will uninstall the update and you should be good to go. **We only just sorted this out after installing the updates today. I actually uninstalled a few before this one, as I was doing them one at a time and rebooting each time. Came good after that update was uninstalled, so it’s possible it’s a combination of updates. If you’re not sure what updates have been installed, just type “DIR” into the recovery console and see all the $NTUNINSTALL folders and see which one’s match the install date. Thank you so much! I reposted your solution in my blog linking to your original comment. I was about to embark on a search to find the culprit and was lucky enough to find your comment and save time. Thanks for the hint about the kb3067505 being a dud. We had a few 2003 systems die because of it. Using the recovery console and getting it out fixes the problem and gets the systems back online. Interesting how one of the last updates for 2003 kills the system. I wonder if microsoft will step up with a fix for it, or if it is just a big middle finger salute to whoever is still stuck with the system. Thanks so much for this great service every month. I do not use Internet Explorer or email programs from MS. My question is do I need to download the updates for IE?. Thanks. Awesome and perfect timing with the fix. For each one that died, I have had only enough time to setup dhcp on another server with a higher ip pool range. I thought I shut off updates on the other servers, but found another dead this morning. The fix worked perfectly. Of all the servers that installed the updates it was only the x64 bit machines that failed. Thanks Beau, I almost gave up with one critical SQL server as that would not boot up after latest patches.. was always restarting and in safe mode stopped with ACPITABL.DAT file, Found tons of tricks to fix it and none helped until I found this tip of removing the KB3067505. Need to check other servers as well as we unfortunately still need few in production use.